ATAC Resources and Barrick Gold to … | ATAC Resources Ltd.
April 4, 2018 - Vancouver, BC - ATAC Resources Ltd. (TSX-V:ATC) (“ATAC”) is pleased to announce the 2018 exploration program for its 1,700 km2 Rackla Gold Property in east-central Yukon. The combined 2018 exploration budget for the Rackla Gold Property is ~$13 million and includes $7 million from ATAC and $6 million from Barrick Gold Corp. (“Barrick”).The program will include ~20,000 m of diamond drilling and is planned to begin in May.The focus will be on identifying and expanding high-grade gold mineralization at existing zones within the Osiris and Orion Projects, and advancing 2017 prospecting discoveries at the Rau Project. 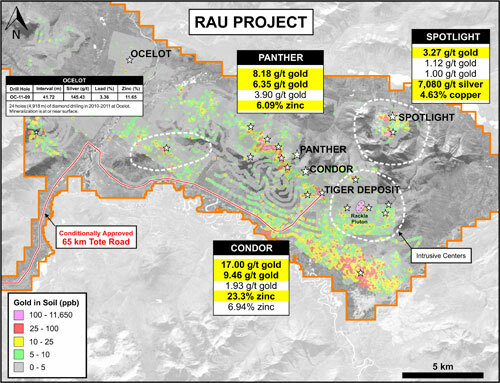 Sampling, prospecting and mapping of high-priority Rau Project targets discovered, or advanced, during the highly successful 2017 prospecting program. Under an April 2017 earn-in agreement, Barrick can acquire up to a 70% interest in the 780 km2 Orion Project following the completion of total expenditures of $63.3 million.These expenditures include a flow-through private placement under which ATAC received total proceeds of $8.3 million, completed in 2017, and aggregate exploration expenditures of $55 million. The Rackla Gold Property is comprised of three projects: the 100% owned Carlin-type gold Osiris Project, which hosts the Conrad, Osiris, Sunrise and Ibis Carlin-type gold zones; the 100% owned Rau Project, which hosts the Tiger Gold Deposit; and the Orion Project, under option to Barrick. Updated maps and figures can be viewed on ATAC’s website. Diamond drilling on at the Osiris Project in 2017 resulted in the discovery and expansion of high-grade gold mineralization at the Conrad, Sunrise and Osiris Zones. The newly-identified mineralization will be followed up through systematic step-out drilling in 2018. High-grade, structurally-controlled gold mineralization was encountered within both the 350 and 650 Fault corridors at the Conrad Zone in 2017. On the eastern side of Conrad, hole OS-17-238 targeted an area of limited drilling within the 650 Fault corridor and returned a high-grade, near-surface mineralized interval of 12.50 m of 20.78 g/t gold from 54.86 m. Holes OS-17-257 and OS-17-259 also targeted the 650 Fault corridor at the structural intersection with the Nadaleen Fault and returned high-grade gold intersections of 12.19 m of 9.44 g/t gold and 25.91 m of 5.44 g/t gold, respectively. On the western side of Conrad, hole OS-17-233 intersected 67.06 m of 3.35 g/t gold, including 15.14 m of 7.25 g/t gold, within the 350 Fault corridor, which highlights the high-grade nature of the structurally controlled mineralization. Drilling in 2018 will focus on systematically stepping out from known gold mineralization within these fault corridors. The Conrad Zone remains open in all directions. Mineralization within the Sunrise Zone occurs as sub-parallel tabular bodies that dip steeply to the south, paralleling the Sunrise Fault.Drilling at Sunrise in 2017 showed strong continuity with a consistent increase in the grade of the mineralization with depth. The higher grades are demonstrated in hole OS-17-249, which returned 10.42 m of 7.97 g/t gold and 15.24 m of 13.52 g/t gold.Drilling will continue this systematic expansion of the zone both at depth and along strike from the previously delineated mineralization. The Sunrise Zone remains open at depth and along strike. Gold mineralization at the Osiris Zone is most strongly developed at stratigraphic boundaries where mineralizing fluids become focused. This gold concentration is demonstrated in OS-17-244 where 12.19 m of 9.60 g/t gold was intersected at the stratigraphic contact between the limestone and mudstone rock units.Drilling at the Osiris Zone in 2018 will continue to step out on mineralization that has only been outlined through cursory drilling in 2011 and 2017. The Osiris Zone remains open along strike and at depth. Barrick’s 2018 diamond drill program at the Orion Project will consist of approximately 10,000 m of diamond drilling targeting gold mineralization. The first year of Barrick’s earn-in option and work was focused on systematically establishing a surface and sub-surface geological, geochemical and structural framework of the Orion Project area. The presence of robust Carlin-type alteration identified in 2017 diamond drill holes, well away from any surface geochemical anomalies, demonstrated that favourable environments for the development of gold mineralization at Orion are more extensive than previously understood. The results of the 2017 work are being evaluated by the joint Barrick-ATAC exploration team to prioritize the targets for diamond drill testing in 2018.Diamond drilling will mainly be focused along the 6 km long Anubis Fault corridor. Prior to the Barrick earn-in agreement, ATAC completed ~3,000 m of diamond drilling within the Anubis Fault corridor, and highlights include: 8.51 m of 19.85 g/t gold from the Anubis Zone and 61.29 m of 2.75 g/t gold from the Orion Zone. Nine other prospecting discoveries within the Anubis Cluster (Ana, Corona, Columba, Dale, Dorado, Draco, Hydra, Lyra and Zodiac) have received only cursory follow-up since their discovery in 2013. ATAC will follow-up on gold and base metal potential across its 660 km2 Rau Project located at the western end of the Rackla Gold Property. Prospecting in 2017 was designed to advance and prioritize the many known gold and base metal targets along trend from the advanced stage Tiger oxide gold deposit. Exploration along trend of the Tiger Deposit in 2018 will include a targeted advancement of the Condor, Panther and Spotlight Targets.Work will include hand pitting, prospecting, and geological mapping. First pass geochemical soil sampling will be conducted over a large area around the Spotlight Target not previously sampled. 8.18 g/t gold and 6.35 g/t gold at the Panther Target. The 7,080 g/t silver sample noted above is the highest silver-in-rock sample collected to date on the Rau Project. Additional grab samples collected from the 350 by 250 m Spotlight Target returned elevated gold, copper and tin, a typical metal suite associated with skarn mineralization. In preparing for the 2018 field season, ATAC completed a desktop evaluation of the district-scale potential for intrusive-related mineralization through the reinterpretation of existing geochemical and geophysical data sets. The results of this work suggest the potential for three distinct intrusive centres beneath the Rau Project. All three intrusive centres and priority geophysical anomalies will be further evaluated during the 2018 field program. In March 2018, ATAC received a joint Decision Document from the Yukon Government and the First Nation of Na-Cho Nyak Dun stating that the proposed 65 km, private, all-season tote road to the Tiger Gold Deposit will be allowed to proceed. 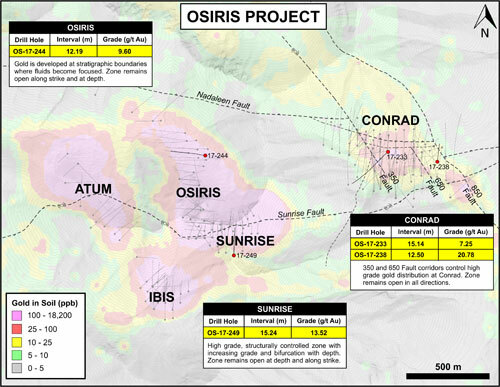 The reported intersections are drilled thicknesses and are believed to represent approximately 50-70% at the Sunrise Zone, 70-100% at the Osiris Zone, 40-100% at the Conrad Zone, and 50-60% at the Ocelot Zone. Based on the character of the mineralization and the limited drilling at Anubis and Orion, it is not possible to determine the true width of the mineralized intersections at this time. All prospecting grab samples reported in this release represent significant results only. Below detection values for gold, copper, silver, and zinc were encountered in grab samples from the 2017 prospecting program. The technical information in this news release has been approved by Julia Lane, P.Geo., Vice President of Exploration for ATAC and a qualified person for the purposes of National Instrument 43-101. ATAC is a Yukon-based exploration company focused on developing Canada’s only known Carlin-type gold district alongside Barrick at its Rackla Gold Property. Recent work on the ~1,700 km2 property has resulted in a positive Preliminary Economic Assessment for the Tiger Gold Deposit, drilling of multiple high-grade Carlin-type gold zones and the identification of numerous early-stage gold exploration targets. ATAC and Barrick have partnered to explore the Rackla Gold Property’s Orion Project, with Barrick having the option to earn up to a 70% interest in Orion by spending $55 million in exploration. ATAC is well-financed with approximately $13 million in its treasury and will be conducting one of Yukon’s largest drilling campaigns in 2018. On behalf of Management and the Board of Directors of ATAC Resources Ltd.